pwnd by #anonymous — a conspiracy writ large | What's that you said? I was never a child of Watergate (I came of age during Reagan’s tenure), but my mother was and so I grew up listening to her hold forth on Nixon, Liddy, the CIA and many others. So to me, conspiracies are as natural a way of viewing politics and events (although I do my best to appear otherwise normal). To this day, if you mention Nixon’s name in my mother’s presence, you’ll be treated to rants of near epic proportions. Of course, that also meant I grew up learning about IMF and CIA’s operations in South America and around the globe. She is at present reading A Terrible Mistake which details how and why Dr. Frank Olson was murdered back in 1953. She highly recommends this book, by the way, and I’m in line after my brother in law to read this (I love my family 🙂 ). I did leaf through this book yesterday and one thing the author said in his preface that struck me was how the bulk of his documentation and verified information came from the CIA’s own files, that were never intended for public consumption. He said that even though we might think this was the least reliable source of information, it turned out to be the best — once he could access and read the information. To me, this points straight back at the crucial need for transparency and accountability we must demand from governments, corporations, and media. Before I plunge into the real topic at hand (I know, I know, I’m a terrible digressor — just blame my father for that one), take a quick look at this very interesting article: Why platforms leak. And now of course we have the internet. And the web. With their concomitant flattening and democratising. Where everyone’s an actor, with the power to write, to edit, to delete, to publish, the tools of trade of the knowledge worker. A worker who now has the power to access, edit, alter and disseminate information at high speed and low cost to all and sundry, in the language of their choice, to the device of their choice, when and where the recipient wants. A world where the distinction between information consumer and information producer no longer exists. Which is where the problem lies. We’re going through a process of horizontalising of everything, of “small pieces loosely joined”, of “high cohesion and loose coupling”. Platforms are now no longer hierarchical, they’re closer to being independent layers, often of different sizes and shapes. Almost counterintuitively, the glue that reduces friction between layers is the API, that which allows the small pieces to be loosely joined, that which ensures that the small pieces are loosely coupled. It is this loose coupling, this high cohesion, that allows for the flexibility that underpins adaptive systems, and makes that which appears to be complex simpler. In the Information Age, these small pieces start acquiring new roles; some consume information; some produce it; some do both; some make lists of information, index them, tell people where to find information; some translate information, change format, change language, render for different devices; some make the devices that support all this; some make the software that empowers everyone to do the consumption, editing, publishing; some transport the bits; some manage access and use rights. All this happens in a digital world, where reproduction and transmission of information is becoming cheaper by the minute. Attempts to implement end-to-end control in such environments are doomed to fail; in essence there is no point in attempting to tighten what is designed as loose coupling, it doesn’t work. Which is why platforms leak. Keep that in mind — information is the currency now, information is what flows from one point to the next. This ubiquity of information inherent to the online world underlies the conditions that potentially lead to transparency and therefore accountability. Just keep that in the back of your head. So, back to the story of Aaron Barr and HBGary Federal. When this story initially broke, it was mostly an amusing, geeky, footnote. I mean, what’s not to be amused by a security firm, in attempting to collect information on the Anonymous collective, winding up pwnd by Anonymous itself, which then proceeded to take down the firm’s website and publicly post all of its email to the internet? Add to that Anonymous’ point that Barr didn’t even have the correct contact information on the list he planned to sell to the FBI — despite claiming that he wasn’t going to reveal the results of his research? You can even see Barr playing with fire here. It’s a great bit of schadenfreud to indulge in before passing on to the next news item. However, the story has only continued to grow, as the emails are dissected and analyzed, and the picture that emerges takes the story quickly from amusing, to bizarre, to downright disquieting. Let me recap: After HB Gary’s emails were posted with Anonymous’ initial declaration that Barr clearly planned to sell his “information” to the FBI (which is, of course, very interested in locating Anonymous, people started going through the emails in detail and uncovered much more, including a plot to bring down Wikileaks. I want to pause for a moment and point out that the information uploaded by Anonymous from HB Gary Federal’s computers is huge — more than 50K emails over the last decade or so. Going through all of these has actually been something of a crowdsourced project — that is, thousands of people online poring through different sections of the email. This kind of technique has proven very effective at many large scale tasks, including thoroughly canvassing a huge amount of data in a short amount of time, using a “distributed system” composed of people rather than computers (though of course all linked in through computer networks). This has proven time and time again extremely useful in vetting large amounts of information and proved itself again with HB Gary’s information. So… blackmail, sabotage. Lovely stuff. You can find more complete details here: Data intelligence firms proposed a systematic attack against WikiLeaks, Private Contractors Plan To Protect Bank Of America From WikiLeaks By ‘Neutralizing’ Glenn Greenwald, Others, Hackers Reveal Offers to Spy on Corporate Rivals. Note that the information here is from HB Gary itself; that is to say it is the source of the most accurate information about itself, rather like the CIA turned out to be in the case of Frank Olsen. Glenn Greenwald and Salon weighed in shortly on these developments: The leaked campaign to attack WikiLeaks and its supporters and A disturbing threat against one of our own. The fallout has been interesting, to say the least: Not only did Dr. Alex Karp, the co-founder and CEO of Palantir Technologies, one of three data intelligence firms who worked to develop a systematic plan of attack against WikiLeaks and their supporters, sever all ties with HBGary, he issued a personal apology to Glenn Greenwald, and his statement can be seen here. Salon also indicated that the CEO and COO of Berico similarly stated that they had “discontinued all ties” with HBGary Federal. But after learning a lot more over the last couple of days, I now take this more seriously — not in terms of my involvement but the broader implications this story highlights. For one thing, it turns out that the firms involved here are large, legitimate and serious, and do substantial amounts of work for both the U.S. Government and the nation’s largest private corporations (as but one example, see this email from a Stanford computer science student about Palantir). Moreover, these kinds of smear campaigns are far from unusual; in other leaked HB Gary emails, ThinkProgress discovered that similar proposals were prepared for the Chamber of Commerce to attack progressive groups and other activists (including ThinkProgress). And perhaps most disturbing of all, Hunton & Williams was recommended to Bank of America’s General Counsel by the Justice Department — meaning the U.S. Government is aiding Bank of America in its defense against/attacks on WikiLeaks. 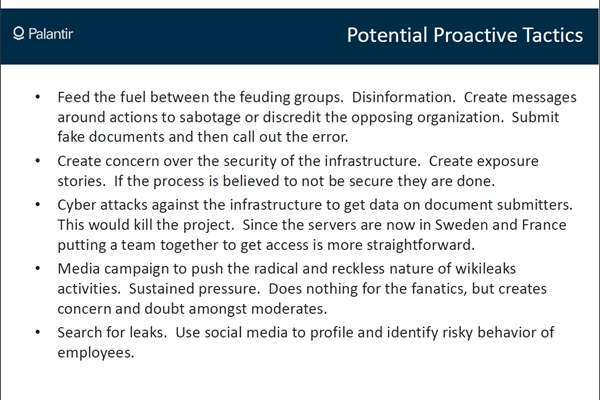 That’s why this should be taken seriously, despite how ignorant, trite and laughably shallow is the specific leaked anti-WikiLeaks proposal. As creepy and odious as this is, there’s nothing unusual about these kinds of smear campaigns. The only unusual aspect here is that we happened to learn about it this time because of Anonymous’ hacking. That a similar scheme was quickly discovered by ThinkProgress demonstrates how common this behavior is. The very idea of trying to threaten the careers of journalists and activists to punish and deter their advocacy is self-evidently pernicious; that it’s being so freely and casually proposed to groups as powerful as the Bank of America, the Chamber of Commerce, and the DOJ-recommended Hunton & Williams demonstrates how common this is. These highly experienced firms included such proposals because they assumed those deep-pocket organizations would approve and it would make their hiring more likely. But the real issue highlighted by this episode is just how lawless and unrestrained is the unified axis of government and corporate power. I’ve written many times about this issue — the full-scale merger between public and private spheres — because it’s easily one of the most critical yet under-discussed political topics. Especially (though by no means only) in the worlds of the Surveillance and National Security State, the powers of the state have become largely privatized. There is very little separation between government power and corporate power. Those who wield the latter intrinsically wield the former. The revolving door between the highest levels of government and corporate offices rotates so fast and continuously that it has basically flown off its track and no longer provides even the minimal barrier it once did. It’s not merely that corporate power is unrestrained; it’s worse than that: corporations actively exploit the power of the state to further entrench and enhance their power. Anonymous has since put out their own leaks distribution point: Anonymous Ready To Dump More HBGary E-mails, Launch AnonLeaks. This ties into what I have said before about the concept and structure of Wikileaks being entirely duplicatable. 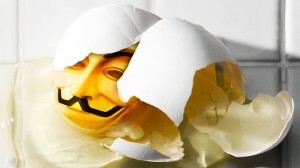 In addition, what Anonymous has done is not just extend Wikileaks, but also shown the world that corporations need to be held accountable, that transparency and leaking are effective tactics, and that with online culture, community, and tools, it is possible for all of us to hold them accountable. After all corporations, especially very large ones, or multi-national ones, really operate along very similar lines to governments. Furthermore, these companies, without any kind of internal constitution, behave like dictatorships, and if they are no longer even beholden to the basic law of the land, in reality don’t even have the checks otherwise provided by the law. Anonymous has shown us the way around this problem. No wonder the FBI, the DoJ, and companies such as BoA, are all so anxious to take down Wikileaks and Anonymous. But as I’ve already pointed out, the online world is inherently leaky. There really isn’t any other way to have it. The online world is distributed, without a single leader, or a heirarchy to exploit — so going after any of us individually still leaves the whole free to act and retaliate. Which is why it’s no wonder that governments attempt to kill the Internet under “dangerous” — to them — conditions. The existence of the Internet means we have the tools to level the global playing field. It means we can take on other companies. We could even start dismantling global level conspiracies of the sort Naomi Klein warns us about in her book. This entry was posted in legal, media, news and tagged aaron barr, anonymous, frank olson, glenn greenwald, online culture, wikileaks. Bookmark the permalink.